This 3D printing technology is a very well rounded option for creating prototypes and even end use parts. The industry leader in FDM technology is Stratasys. They provide 3D Printing options from desktop 3d printing all the way up to industrial grade 3D printers that specialize in large parts and tight tolerances. 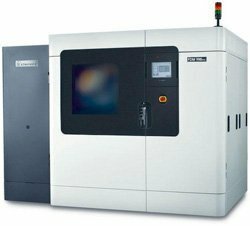 FDM industrial grade machines are capable of creating end use parts for short run manufacturing solution in the form of "direct digital manufacturing." FDM technology is able to produce parts to 0.005" (.127mm) tolerance consistently and reliably without tooling and molding costs. Because of the relatively low cost and durability, FDM provides a widely adopted method of creating parts that are accurate, durable and made from many widely used, industrial grade thermoplastics. ABS M30 - great all around durability great for prototype and small run part manufacturing. ABS M30i - used in medical applications this material is biocompatible and can be sterilized. ABSi - translucent in nature this option is perfect for creating tail lamp assemblies pre production in the automotive industry. ABS-ESD7 - this option provides "electrostatic dissipative" properties for sensitive electronic devices. PC-ISO - This is a popular choice for food and pharmaceutical packaging. Additionally, medical devices are often made using PC-ISO because this material can be sterilized. PC - Polycarbonate is widely used all industry including automotive, aerospace and medical. Ultem - flame retardant and provides great durability. It has a very high strength to weight ratio. Ultem is a very impressive thermoplastic that provides unmatched strength in the FDM process. All of these materials are widely used in industry. They can be vacuum formed, injection molded, and milled, but 3D printing using these materials means you get functional prototypes without molding and tooling cost. Additionally, for short run manufacturing 3D printing using these industrial grade materials will save you money and get your parts created faster than any other production technology.